Check out the free TAROT DALI. Tarot reading is part of cartomancy, and should be taken as a guide for our life tips. It is believed that the energy of the consultant is which is unconsciously impregnated during a tarot reading, and so the combination of the meaning of selected cards can be interpreted. Tarot can help to understand current and future situations of our lives; many take it as an art in the world of divination. There are those who believe, within the esoteric world, that cards are perhaps guided by a spiritual or supernatural force as a guide, while others believe that tarot helps to understand the collective unconscious. Tarot is a mancia used in clairvoyance to predict the future. You can refer to our free tarot for know what holds you luck, work, money, love and much more. There are different types of spins of tarot. In this esoteric site youll find many divination tools online; as the free tarot, among other applications of esotericism. Ask the DALI tarot deck we have to offer you a reading of cards right now. The Dali Universal Tarot deck consists of 78 cards divided in major arcana and minor arcana. The minor arcana are divided into four kinds, which are: batons, coins, cups, and swords. Salvador Dali influenced with his surrealist art in the 20th century, mainly in the decade of the 1920s, as well as in the sixties and seventies inside of pop culture. There are many legends surrounding the creation of the DALI TAROT, his wife Gala, was reader of cards and its said that she helped him. A deck under the seal of Dali was created in 1941, but it was until the 1970s when he signed a contract and officially made the final deck known as Dali Tarot, making 78 pictures, one for each card of the Tarot. The letters were published between 1983 and 1984. As all the decks of tarot, the edition of the master Salvador Dali has its differences respect to others and his surreal and personal seal made of these cards, a mystical deck that has been consolidated in the world of esotericism. Its one of the most valuable and aesthetic decks of the Tarot; some people associate it with controversial legends related to satanism, but its not like that beacause his style is quite distinctive of the surreal that was all the work of Salvador Dalí and as always in them he painted himself for example capturing, in the magician, his face along with his typical melted watch. In every card he painted a Hebrew letter and the corresponding astrological sign .Dalí tarot is not easy to find and there are special limited editions. His price is slightly bigger than other decks . The cards of this deck of free tarot its more large tan others and they are real works of art that you can enjoy with the free tarot that here we offer you. Welcome to the Free Tarot Reading. What do they mean the Tarot cards? Gypsies have a Bible that is the cards of the tarot, according to many experts. Gébelin, who was one of the most famous theorists of the tarot, said that cards drawings had much to do with Egyptian esoteric knowledge. In fact, little is known with certainty of the history of the two decks of tarot. Minor arcanes, cards with figures and numbers from which are derived our modern cards, seem to represent not just Kings, Queens and page boys, but also other sectors of medieval society: the Baton symbolizes farmers, the Cup to the clergy, the Sword to the nobles and the golden coin to merchants. But the French courtiers of the 19th century also attributed prophetic character to those symbols, of which the batons predicted surprises, the cups happiness, swords dead and coins money. The only thing that is known about the major arcanes is that the drawing of the older deck of tarot that is known, and dating from 1392, has hardly changed over the years. Although the secrets and the origin of the tarot remain murky, in 1601 unless one person was forced to take these cards seriously. On March 13 of that year, Cuffe, Secretary of the Count of Essex, was found convicted of treason and hanged, and it was rumored that his future had been predicted by three cards: a prisoner, a judge and a gallows. Tarot cards were used not only to predict the good fortune, but also in games such as the tarochino, introduced in Italy in the 15th century. The most ancient tarot deck that is known, as its been said, its´ believed that was carried out in 1392 for the french mad King Carlos VI. Another of the decks of tarot that most readers use still today, is the french deck of Marseilles, or also known as the tarot of Marseilles. Today the practice of going with a magician or tarotist in person, has been somehow overshadowed by the free tarot online, offered thanks to the technology of the internet and that according to their technique of random, approximates a lot to the certainty that can offer a reader guide in person. The clairvoyance through free tarot, is very used at other decks as the tarot of love. Dalí Tarot is the best Free Tarot Reading Online. Free love tarot card reading. Clairvoyance, esotericism, Tarot online, runes, horoscopes, crystal ball and more. Consult Dali Tarot – Tarot Dalí. Focus on what you want to know and select three cards. 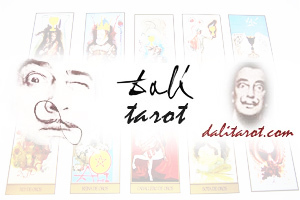 Non official website of Dali Universal Tarot Deck. Free Tarot Reading. Its use is informative and with entertainment finality. 2018.